MOUNTAIN VIEW, Calif., Oct. 17, 2018/PRNewswire/ -- For nearly 100 years, 3D movies have always needed 3D glasses to be worn along with specific seating placement. TronXYZ has now developed the technology to make 3D entertainment glasses-free. The basic idea behind how the technology works is simple: instead of a purely flat screen, TronXYZ uses a special optical device laminated on the top of the regular screen to control the light directions from the pixels on the screen so that both eyes can see different pixels. Essentially one eye sees a different picture than the other eye; this is how we currently view the real world. The benefits to this new technology compared to the old style allow for a much more robust viewing experience. With the current design, structure, and materials, there is no loss of brightness. Historically there are other glasses-free 3D solutions, however, the user will experience a 70% brightness loss. The second issue with the old glasses-free 3D technology is that the viewer must remain in the 3D "sweet-spot." TronXYZ's technology makes it possible for the viewer to be in a large spectrum of viewing positions, distances, and angles without any drop in quality. Finally, the technology is not limited to keeping a device in only landscape mode, but also watching glasses-free 3D content in portrait mode. Besides the device's specially designed display screen for large viewing angles, TronXYZ has also developed innovative sub-pixel rendering technology, which means every pixel can be rendered according to the operator's viewing angle, distance, and position. When 3D content is detected, the eye tracking engine inside the device tracks where a person is viewing the screen and passes that information to the sub-pixel rendering engine to make sure every pixel displayed is optimal. With TronXYZ's 3D technology, you no longer have to hold your phone at a certain angle to be comfortable. Eye tracking technology allows you to be flexible on what angle or position you want to view your 3D content in. TronXYZ's current 3D viewing technology is already years ahead of what was thought possible; the future only seems to hold the brightest and the highest definition viewing experiences. 3D technology will be useful in the medical field, keep industrial applications safe, be popular in the education industry, and create the next blockbuster hits. Today we’re starting to roll out 3D photos, a new way to share your memories and moments in time with a fun, lifelike dimension in both News Feed and VR. With technology that captures the distance between the subject in the foreground and the background, 3D photos bring scenes to life with depth and movement. Whether it’s a shot of your pet, your friends, or a beautiful spot from your latest vacation, you just take a photo in Portrait mode using your compatible dual-lens smartphone, then share as a 3D photo on Facebook where you can scroll, pan and tilt to see the photo in realistic 3D—like you’re looking through a window. You can also view 3D photos in VR using the Oculus Browser on Oculus Go or Firefox on Oculus Rift. 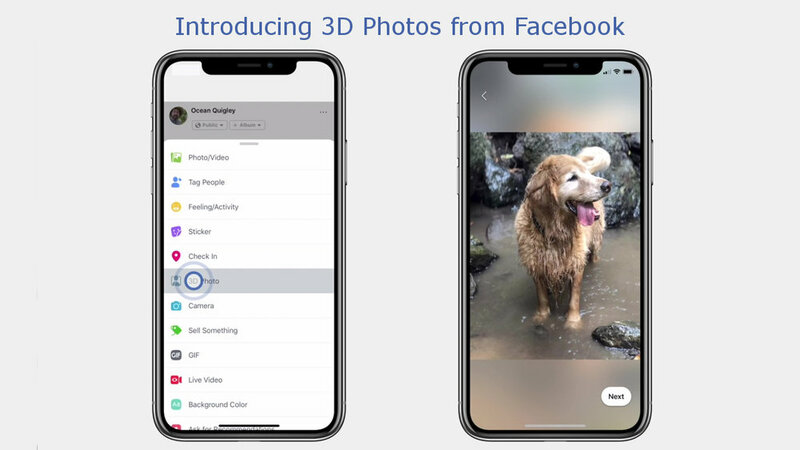 Everyone will be able to see 3D photos in News Feed and VR today, while the ability to create and share 3D photos begins to roll out today and will be available to everyone in the coming weeks. 2. Keep contrast in mind. You’ll get more of the 3D effect when your photo’s subject has contrasting colors—for example, someone wearing a blue shirt standing in front of a blue wall won’t pop as much as someone wearing a different color. Some materials and subjects make better 3D photos than others. You’ll get the best results from subjects that have some texture to them, have solid edges, and aren’t too shiny. Try to avoid transparent objects like clear plastic or glass, as they aren’t always accurately captured by depth sensors. We’re listening to feedback on this new format as we continue rolling it out to everyone. We hope it will help you share your moments in a new way — and we can’t wait to see what you’ll create! Adolph Vega interviews Bob Furmanek from 3-D Archive . 3-D Film Archive converts classic golden age 3-D movies for release on 3-D Blu-rays . Adolph Vega interviews with Marvel Studios Stereoscopic 3D Supervisor Evan Jacobs. How do 2D movies get converted into 3D ? Do you ever have conversations with the director(s) or cinematographer(s) on how to make the movies look best in 3D ? 3D is popular in foreign markets, how do you make a 3D Movie work with subtitles? What about government censorship. Are these aspects considered? Do you think Converted 3D can look as good as native 3D? We ask him this and many more questions on this very special podcast. © 2018 MARVEL / © Disney. All rights reserved.